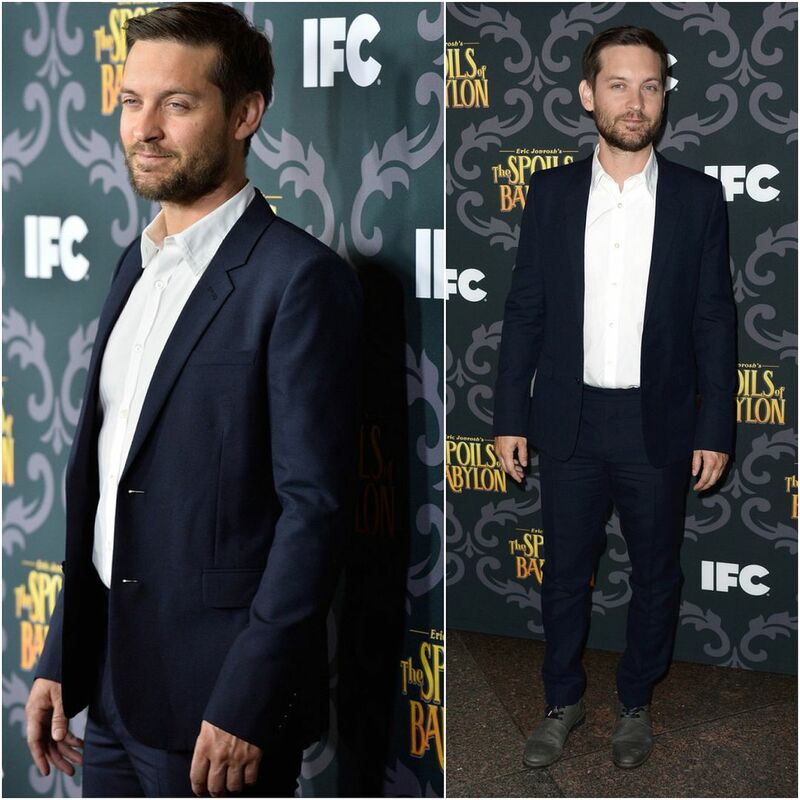 Tobey Maguire attended the screening of 'The Spoils Of Babylon' at DGA Theater on January 7, 2014 in Los Angeles, California. Tobey Maguire wore a blue suit in silk and wool from Saint Laurent by Hedi Slimane, over a white cotton shirt also from the same label. Light greyish boots completed his look for the event. 'The Spoils of Babylon' is an American comedy miniseries starring Tobey Maguire, Jessica Alba, Val Kilmer, Haley Joel Osment and Michael Sheen, amongst many others. It is intended to be a spoof of the epic-scale "TV event" miniseries prevalent on American network television in the 1970s and 80s. Thought Tobey Maguire looked really good at the event. Love the trousers length and choice of the unconventional boots to go with the suit. A little bit of shirt cuffs would be nice, but that would be nit picking. I was undecided if I like the belt-less look, but concluded yes it worked. A very neat look, all the way up to the classic side swept hair, nicely balanced with the scruffy beard and boots. Not sure if it's a good look for him - he looks a bit short and chubby.